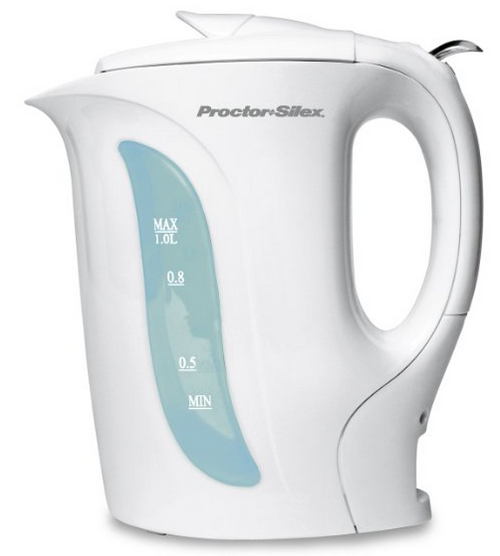 Proctor -Silex 1 Liter Electric Kettle Only $8.99 PLUS FREE Shipping with Prime! You are here: Home / Great Deals / Amazon Deals / Proctor -Silex 1 Liter Electric Kettle Only $8.99 PLUS FREE Shipping with Prime! If you like tea, this is the deal for you! Heat up water for tea, instant coffee, and noodle snacks with the Proctor -Silex 1 Liter Electric Kettle for Only $8.99 PLUS FREE Shipping with Prime! This would alos be great for heating up water to make iced tea this summer! Get Yours Now! To take advantage of the FREE shipping in this deal, sign up for a FREE 30-day trial of Amazon Prime!